"One right to which few intellectuals care to lay claim is the right to wander, the right to vagrancy. And yet vagrancy is emancipation, and life on the road is liberty: one day bravely to throw off the shackles with which modern life and the weakness of our heart encumber us, in a pretence of liberty; to arm oneself with the symbolic staff and bundle and run away". Those are the opening lines from the collection of Isabelle Eberdardt's writing titled Prisoner of Dunes, and it is now time to arm myself with the symbolic staff and bundle and run away from blogging for a while and leave you with a different perspective. 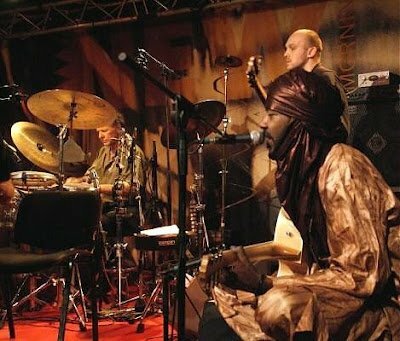 That is Nabil Othmani (right foreground) and Steve Shehan (left background) in the header photo, and my music to run away by is their recent album Awalin. Nabil Othmani was born in Djanet in the Algerian Sahara and there is a chilling convergence of paths at this point. His father was the great Tuareg oud player and singer Baly Othmani whose body was found in the river running through Djanet in 1995. Isabelle Eberhardt bravely threw off the shackles of modern life and chose to wander, only to drown in the river running through the Algerian Saharan town of Ain Sefra in 1904. Adieu.